We are playwrights passionately creating stories about extraordinary women in history and actively seeking production and publication. Produce pieces by women and about women! You can search through our herstorical women and also our fabulous playwrights at the top. Check out the ‘About 365’ page if you are interested in getting involved or want to have a 365 festival or play at your theatre. Find out more: ABOUT US! PLAYWRIGHTS: CLAIMS ARE NOW OPEN FOR 2019! Please check out the 2019 Information Page for everything you need to know. If you have questions please email 365womenayear@gmail.com. We look forward to writing with you. Fabulous article on the Fifth Annual 365 Festival at Rover Dramawerks in Texas! 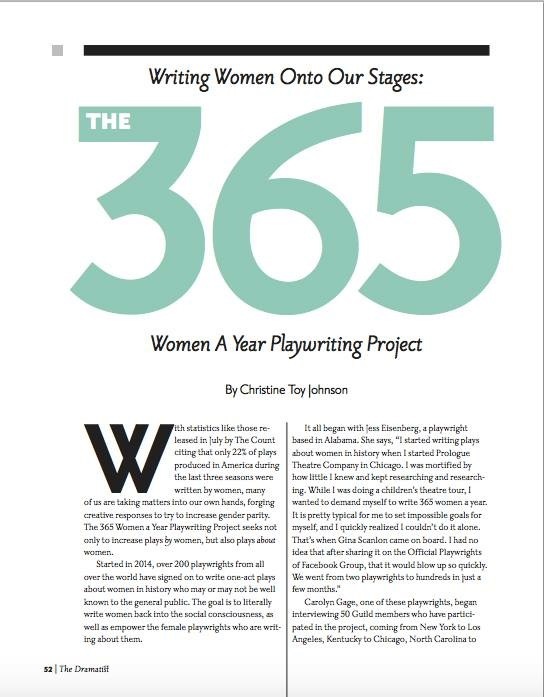 Check out a great write up about our recent 365 festival at Florida State University with White Mouse Productions. Our wonderful playwrights in Spain have had their pieces published! 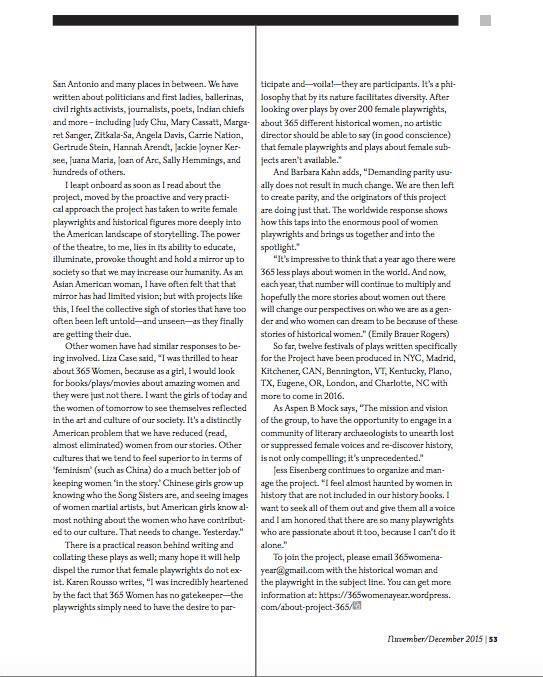 We are happy to be an affiliate of Women in the Arts & Media! For more press check out our Press Page! MARCH 28 & 30: NOPlays HERSTORY! After the Thin Man by Shellen Lubin, Little Swan by Allie Costa, A Moment of Silence by Allie Costa, Frida Khalo: Heartbreaker by Lylanne Musselman, The performances will take place March 28th and 30th at the New Haven Free Public Library. JANUARY/FEBRUARY 2019: ANNE SEXTON, SYLVIA PLATH, and AMY WINEHOUSE performs at Hyde Park Theatre, as part of FronteraFest 2019—the “largest festival of its kind in the Southwest.” January-February 2019, Austin, TX. Written & Directed by Rita Anderson. Starring Johanna Whitmore, Nola Lafayette, and Amelia Turner. SEPTEMBER 27-29 “Partner of-” by Rachael Carnes will be at the Midwest Dramatists Center – September 27-29, Kansas City. AUGUST 9th-12th “Amanda Transcending” by Connie Bennett as a 15 minute piece in 2015. After experiencing the 2016 Inge Festival PlayLab, it’s now a full length piece, opening tonight as part of Theatre 33’s New Play series. JULY 13-29, 2018 Susan Hansell’s play EVERY CONCENTRATED FRAGMENT will be produced for 9 performances by the Tucson Players during their annual new play festival, July 13 – July 29, 2018 at the Tucson Community Playhouse, as directed by Scott Berg. June 9-10, 2018 The Arts at Angeloria’s and Herstory Theater and producing “Anne,” by Gabriella Oldham. Directed by Rosemarie Beskind. MAY 2018 J.Lois Diamond’s play, Hello Ocean, which was inspired by Nina Simone, has been selected for presentation in the New Play Lab of the 37th Annual William Inge Theater Festival. It will receive a public reading in May 2018. Only 20 scripts were chosen this year, from a crowded field. MAY 2018 Beatrix in the Shadows by D Lee Miller will be performed at B3 Theatre’s First Festival of Shorts! Performances will be on May 11, 12, 18, and 19 at 8PM. Their venue is The SIC Sense Theatre, 1902-9 E McDowell Road, Phoenix, AZ if you’re in the area. Thanks to Ilana Lydia, Artistic Director at B3 Productions! MARCH 18-21, 2018 History Lezons: A Festival of Short Plays at the Pride Arts Center in Chicago. Playwrights represented will include Sharece M. Selllem, Asia Nichols, Allison L. Fradkin, Robin Rice, Pat Montley, Shelley Hobbs, Shellen Lubin, Natalie Meisner, and Lena Wilson. The plays will be directed by Brianna Buckley, Denise Yvette-Serna, Charlotte Drover, JD Caudill, Taylor Craft, Nemo Serges, Alyssa Vera Ramos, Iris Sowlat, and Elizabeth Swanson. MARCH 9-11, 2018 2Cents Theatre in Acting Out INK Fest, March 9-11, 2018, in Los Angeles will produce Lolly Ward’s play about Ethel Payne, The Ethel Party. MARCH 3, 2018 Oregon SWAN Day/365 Women a Year Readings presented by Oregon Contemporary Theatre and Northwest Ten Festival. Saturday, March 3, 2018, Oregon Contemporary Theatre, Eugene – 2:00 p.m. Open Public Reading (FREE) Readings of seven short plays by Oregon women, written as part of the 365 Women a Year Playwriting Project: “Invention” about Hedy Lamarr, written by Lolly Ward. “In Her Footprints” about Mary Leakey and Lucy, written by Connie Bennett. “Unter Investigation” about Mary Lou Kownacki, written by Nancy Hopps “New Year’s Ever 1939” about Alexandra Kollontai and Ada Nilsson, written by Barbara Corrado Pope.”Ice Front” about Elsie Parmann, written by Rachael Carnes.”Dancing with the Light” about Loie Fuller, written by Dorothy Velasco.The 48 Different Brilliant Colors of Magdalena Abakanowicz” about Magdalena Abakanowicz, written by Merridawn Duckler. Free. Suggested donations to Ophelia’s Place. For more, check out our PAST PRODUCTIONS PAGE!